We pride ourselves on the quality and range of our brushes. 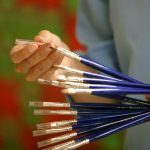 Our brush lines include our own in-house line of Nimbus Watercolour brushes, Winsor & Newton Oil, Watercolour, and Acrylic brushes, Liquitex Acrylic brushes, the beautiful handcrafted Spanish Escoda Oil, Watercolour, and Acrylic brushes, and more. 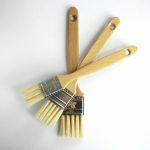 We augment these brush lines with a selection of palette knives, calligraphy brushes, craft and utility brushes, and brush sets ranging from professional to beginner. Come in and find the brush you’ve been dreaming about!